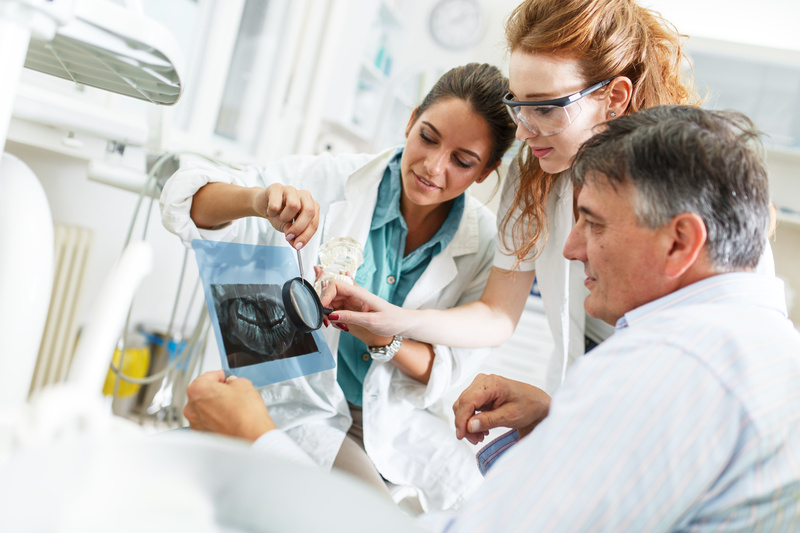 A general overview of the dental profession is given including a discussion of professional associations, dental specialties, and the role of the dental assistant in the general dental office. Dental ethics is reviewed emphasizing the dental assistant’s obligation to observe established principles. A comparison is made between ethics and jurisprudence. This course includes an introduction to basic infection control and assistants are taught how to protect the patient, doctor, and themselves . This course is designed to give the student basic skills in the initial reception, seating, and examination of the patient. Demonstrations are given using basic instruments. Students are taught how to develop a dental x-ray film using the automated processor and how to sterilize instruments. Chairside role-playing situations are created to give students actual experience assisting the doctor. This course is designed to provide the student with an understanding and knowledge of dental anatomy as well as function. The individual characteristics of dental anatomy are studied as well as the human dentition and supporting structures. This course is designed to acquaint the student with the methods and symbols used in the dental office to properly record all needed and existing treatment. The classification of cavities is discussed, and students practice preparing dental charts using appropriate symbols and abbreviations. The importance of maintaining sterility in the dental environment is discussed. Various methods of sanitization, disinfection, and sterilization are practiced. Students are given a broader look at the potential spreading of disease from a dental treatment area and an understanding of protection procedures. This course covers the history of radiography with particular attention given to the potential hazards of radiation. State and OSHA safety laws are discussed along with procedures for effecting proper protection. The students learn about the different types of dental x-ray units, x-ray film, and the procedure for exposing a bitewing film . Students learn how to expose dental periapical x-ray film using the Rinn Bisected-Angle Technique. Film development and mounting are discussed and practiced. Students are given a demonstration of panoramic radiology and gain an understanding of this special procedure . This course is designed to provide the student with a fundamental knowledge of the hand, surgical, and rotary instruments used in the dental office. The student will become proficient in setting up trays and passing instruments . This course is designed to provide the student with a basic understanding of the dental filling materials commonly used in the dental office. The student will become proficient in the manipulation of filling materials through practice simulating conditions of chairside role-playing . This course is designed to provide the student with the basic knowledge as it relates to dental impression materials, waxes, and gypsum products. Students will see demonstrations regarding the use of impression materials and practice mixing these materials until experience is gained . During this course, students will assume a role-playing status and have the opportunity of assisting in various operative procedures. Students will take and develop x-rays, chart dental records, and sterilize instruments. Students will continue chairside role-playing. Students will learn to educate patients about proper dental health care. Brushing, flossing, and diet will be discussed along with special dental health techniques. The student will spend 40 hours in a dental office. This opportunity is offered to the student for practical application of all skills learned while in school. Although the student receives no remuneration, this experience provides actual work experience prior to graduation. Graduates from ASDA are not required to become x-ray certified or coronal polish certified to work as a Dental Assistant. However, Dental Assistants that are certified will have more employment opportunities and earn higher wages. DANB administers the exams and issues certificates. Credentialing for Radiological Proficiency is regulated by the Arizona Board of Dental Examiners (ABDE).